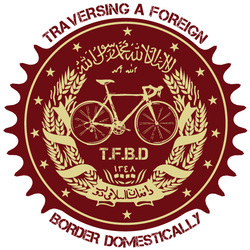 Biking the length and shape of the border of Afghanistan within the U.S.
Beginning and ending at Ground Zero in Manhattan. Please click on the logo at left for more information. Solo Exhibition at Liberty Arts in Durham, N.C.
A series of interior spaces which reference ties to oppressive measures of capitalist practices.